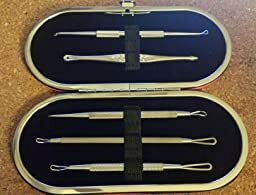 These blackhead removers are the same quality as those used by Dermatologists and Estheticians and are made with 100% Surgical Grade Steel to allow safe sterilization and prevent corrosion. They are also rust free, and stain resistant. 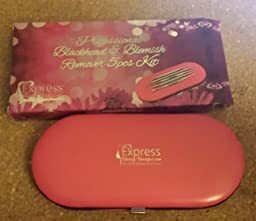 A blackhead or comedone extractor is a tool used to remove whitehead and blackhead pimples, and are designed to pull out the core of the pimple without damaging your skin. Before using an extractor, certain preparation is required to prevent further skin blemishes or infection. Before using these tools, you will want to clean and sanitize them (preferably with Rubbing/Isopropyl Alcohol or Witch Hazel) If you don’t have any of those available, use very hot soapy water and lay on a clean towel to air dry. 1. Trim your fingernails before extracting the blackhead. 2. Wash your hands thoroughly and clean your fingernails. 3. Soak the extractor tips in rubbing alcohol for at least 1 minute before each use. This kills dangerous bacteria. 4. Cleanse your skin with an exfoliating cleanser to remove makeup and excess oils and then rinse with cool or warm water. 5. Fill a sink or plastic/glass tub with hot water. 6. Sit comfortably or lean over the hot water while placing a towel over your head. Remain over the steam for a few minutes. 7. Examine your extractor loops and use the loop with the appropriate size. 8. Place the tip of the extractor over the blackhead and press gently, applying suction to the blackhead. 9. Use the tools with great care and never run it across the face in a sweeping motion. Instead, gently remove each individual blackhead using a slight pressure. 11. Dab a cotton ball with an astringent or toner. 12. Blot the empty pore with the cotton ball. – You will want to soften the blemishes, and open the skins pores. Softening the pimples will make them easier to remove when the pores are opened before using the extractor. – A facial steam, or a hot towel compress will do this and make the extractions much easier. Pores can be opened by placing a hot, wet towel over your face for 2 to 3 minutes (be careful on sensitive skin with Rosacea or broken capillaries not to have the towel too hot), or by taking a hot shower and allowing the steam to open the pores. 2.) Disinfect your hands or wear disposable gloves. -To prevent bacteria on your hands from coming into contact with your face, disinfect your hands by washing them. Disinfecting your hands will help to prevent infection, especially with acne. – Prior to using an acne tool, you will want to disinfect the pimples and blemishes themselves so that bacteria does not inadvertently get pushed further into your pores. Witch Hazel is great, you can apply it on a cotton pad and wipe over face. – Select the right extracting tool for your blemish/pimple. – Whiteheads will need to be poked with a sharp lancet (the middle tool) first before removing them with an extractor (be very careful!). – Pick the size that is most appropriate to the size of the blackhead you are extracting from your face. If you are inexperienced at popping whiteheads with a sharp lancet, I suggest getting this done by a professional Dermatologist (skin specialist) or Esthetician. If you use the lancet improperly, it may result in scarring or other damage to your face. 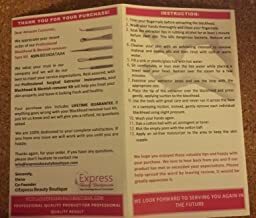 – You can remove blackheads by centering the loop of the comedone extractor over the pimple you want to remove, and gently rocking the tool from side to side while applying light pressure. The blackhead in its entirety will be pulled from the follicle and you will see oil come out from the pore. When you are ready to begin the extraction process lay the preferred tool head on top of the blemish basically surrounding this area with the loop. Apply slow and even pressure until the trapped sebum (oil) is forced out of the follicle. Do not continue to attempt the extraction if the trapped sebum is not released easily. Applying harsh force can cause infection, bleeding and/or scarring. – ONLY Remove whiteheads if you are experienced using a lancet. – To remove whiteheads, you will need to start by poking the whitehead with the lancet to break it open. Once the whitehead is broken open, you will want to center it within the loop of the proper extractor and gently rock the tool from side to side applying slight pressure until it is pulled from the follicle. – If you have any reservations about using the lancet, please go see an experienced professional. A Dermatologist or an Esthetician is experienced in this area and you will avoid permanently damaging your skin and any scarring. – In some cases, your skin may bleed slightly after using the extractor. Lightly pat your skin with gauze or cotton pad to absorb any blood. If extracted correctly, the bleeding should not last long. – It is important to clean affected skin with warm water after extracting to wash off any dirt and bacteria. – Wash tool with hot water before and after use. Let air dry before replacing it in case. I think this is a kit you will enjoy using. If this review helped, let me know.. thanks! * I purchased this product at a discounted price in exchange for my honest opinion and review.